Few may have known, but February was National Pet Dental Health Month. It served as an opportunity for veterinary care teams to educate clients of the health risks of our pets dirty mouths if left untreated. Have you ever been blown away by FiFis’s bad breath? For many of you the answer has most likely, at some point, been “Yes”. Although important, the truth about dental care for our pets runs much deeper than just making that smell go away. The effect of dental disease can alter our pets quality of life and pose tremendous risk to their longevity as our family members. Much like obesity, a dirty mouth can put our pets at risk for diseases that in some cases could potentially be lethal. The mouth serves as a gateway to the rest of our pets bodies due to the amount of blood supply within the mouth. Have you ever bitten your lip or cut your gums before? They bleed well, don’t they? That’s because your mouth is loaded with blood supply. Here’s another question, what is plaque and where does it come from? Plaque is a film on the tooth surface that is produced by saliva and bacteria in the mouth. It’s kind of like bacterial “poop”… I love saying that to clients. Well, it’s true. So, back to the point. You have this “poop” and you have a plethora of blood vessels in the mouth, setting up for bacteria and their toxins to go wherever they want in the body, seeding infections. Those infections can involve organs such as the liver, kidneys, and even the heart causing dysfunction and potential failure of those organs. All of this because of a dirty mouth. What about the obvious? Ever had a tooth infection or root canal? It’s painful, isn’t it? Animal tooth anatomy is much the same as ours. Although they look a little different on the outside in size and number, the inside looks very similar. Each tooth has nerve and blood supply within them, meaning that with injury to the tooth by decay or trauma, they can hurt just they same as you and me. Often times, they just don’t complain like we might, making it difficult to diagnose. 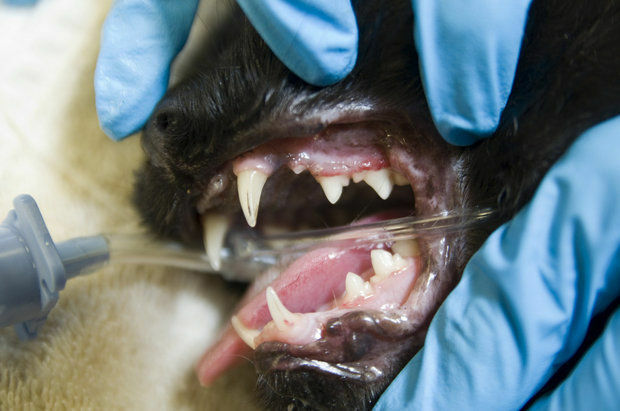 This is why routine examination of the teeth and gums is important for your pet. Finally, and just as important. The structures surrounding the teeth can be effected by the plaque and tartar that builds up on the surface. The majority of the problems arising with dental disease are actually what you can’t see under the gums. Both plaque and tartar lead to gum irritation and potential bone erosion around the teeth. This sets up for further pain and potential infection in the bone surrounding the teeth or affecting other surrounding structures such as the eyes or the nasal cavity. Bottom line, is to have your pets mouth examined by a Veterinarian at least annually if not twice a year. If you have questions regarding the status of your pets mouth, ask your vet. It won’t hurt, and may discover something that is posing serious risk to your pet. Also, have your pets teeth cleaned regularly if your vet recommends it. And yes, anesthesia is necessary if your pet is healthy enough for it. There is no other way to clean sufficient enough underneath a dog or cats gums without them being asleep. Lastly, ask your vet about other preventative steps that can be taken once the heavy tartar and plaque are removed from the teeth. Ideally any preventative measure will help to improve your pets quality of life and keep them around longer.